On March 19, 2019 the Gigawatt Electrolyser project started the gigantic task to overcome key barriers to develop a factory with a capacity of a gigawatts. The partners in the Gigawatt Electrolyser project will jointly investigate what it takes to build such a GW electrolysis plant in the Netherlands around 2025-2030. The project is coordinated by the Institute for Sustainable Process Technology (ISPT), the Amersfoort based intermediary between industry, SMEs, knowledge institutions and government, focused on the development of innovative process technology. 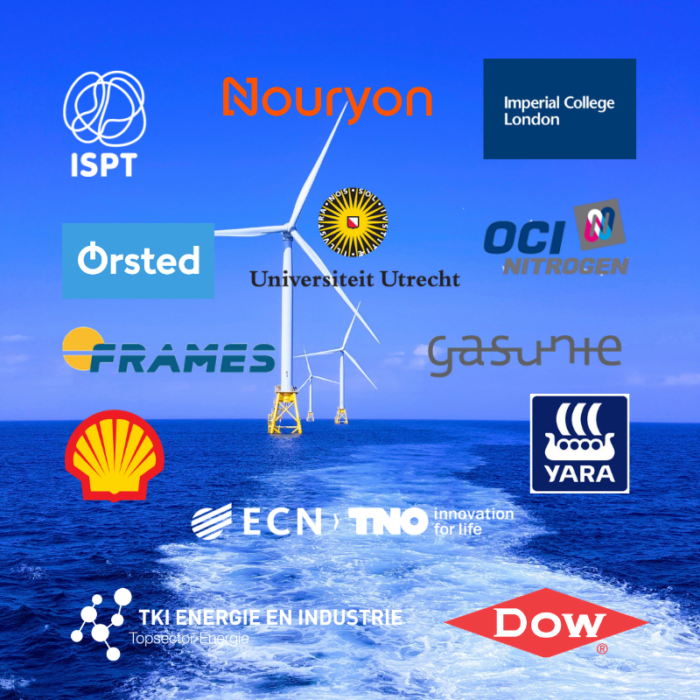 The project is supported by TKI Energy & Industry and partners include Nouryon, Shell, Yara, OCI Nitrogen, Gasunie, DOW Chemical, Ørsted, Frames, ECN part of TNO, Utrecht University and Imperial College London. The project is part of the ISPT Hydrohub program, aimed at the scaling up of green hydrogen production. This also includes the Hydrohub MW test centre for testing new electrolysis technology on a megawatt scale, and an analysis of the future value chain in hydrogen production (HyChain). The Gigawatt Electrolyser project will identify the key barriers to overcome when the numbers of electrolysis cells (so-called ‘stacks’) in an integrated factory are hugely increased. With this ‘numbering up’ it is important that the factory is able to operate in a dynamical fashion. After all, it will operate on electricity from wind or solar parks and will therefore have to cope with a varying electricity supply. It will have to be able to adapt to declining or increasing power supply. Another important aspect of the gigawatt factory is the production of heat and oxygen which are potentially valuable ‘by-products’ of the water electrolysis. The technical design of the factory should take into account the capturing and delivery of hydrogen, heat and oxygen in a way that goes hand in hand with the operational strategy of the large-scale facility. The ultimate goal of the project is to achieve an optimal design at minimal cost. With the current state of technology and current market prices, the investment for a GW electrolysis plant would amount to about one billion euros. The partners in the Gigawatt Electrolyser project aim for a design that reduces this amount three- or fourfold. Bringing the cost back to around 350 million euros for a GW electrolysis plant, would give rise to a competitive alternative for the conventional ‘fossil’ hydrogen technology. An important project aim is to determine how the cost of electrolysers and components can decrease as a result of the scaling up of the electrolysis technology. This entails a study of the expected learning effects in the manufacturing industry which might be comparable to those that have led to cost reductions in wind and solar energy equipment. The project is expected to stimulate innovation in the field of electrolysis technology, thus creating opportunities for the Dutch manufacturing industry in the production of electrolyser modules and components. The ambition of the Gigawatt Electrolyser project goes beyond the drafting of a conceptual design. The next step is to assess how an industrial GW electrolysis plant can be fitted into an industrial environment, and how a specific environment affects the cost of the plant. In the next project phase that is currently under development, case studies will be carried out in collaboration with industry. The focus is on the industrial regions around Vlissingen-Terneuzen-Gent, Rotterdam, Amsterdam, Delfzijl and Geleen. The project is in line with the ambitions and objectives set out in the climate agreements drafted for these regions. Important partners in this next phase of the project include Deltalinqs, Port of Rotterdam, Groningen Seaports, North Sea Port, Port of Amsterdam, the Provinces of Groningen and North and South Holland, Stedin, Smart Delta Resources, USG / Chemelot and Tata Steel.